Are you filled with happiness? 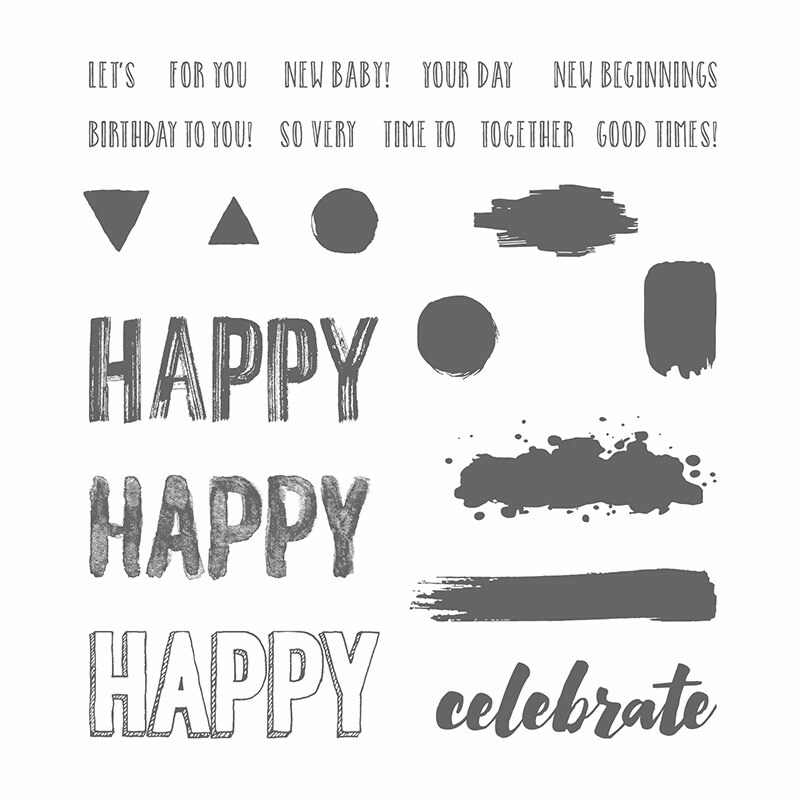 Is there something you want to celebrate? Today I’m all about being happy and celebrating the little things. 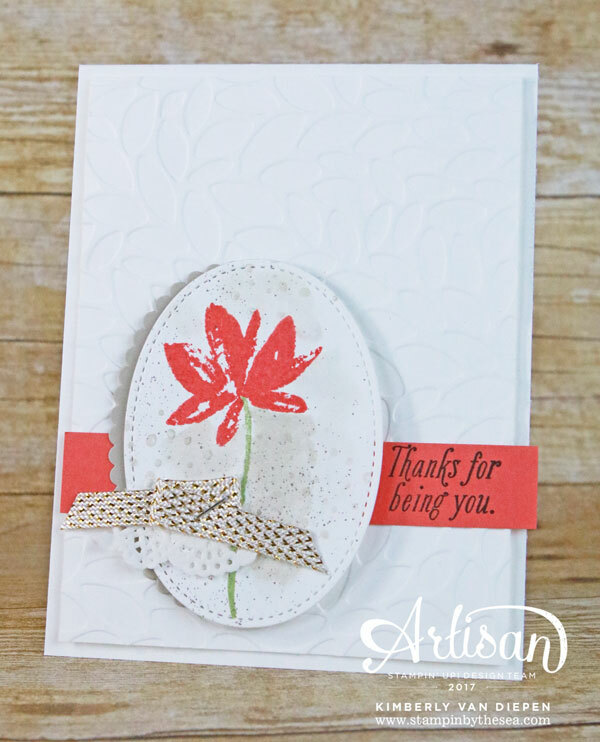 I’m happy to share with the artisans today, and I’m especially glad that I was able to get time to stamp. While my time as a mama has kept me from my stamp room the past few weeks I celebrate the tiny gaps of time, I can stamp. It makes my heart happy! Today, be inspired by the artisan team. Let us celebrate the little things. 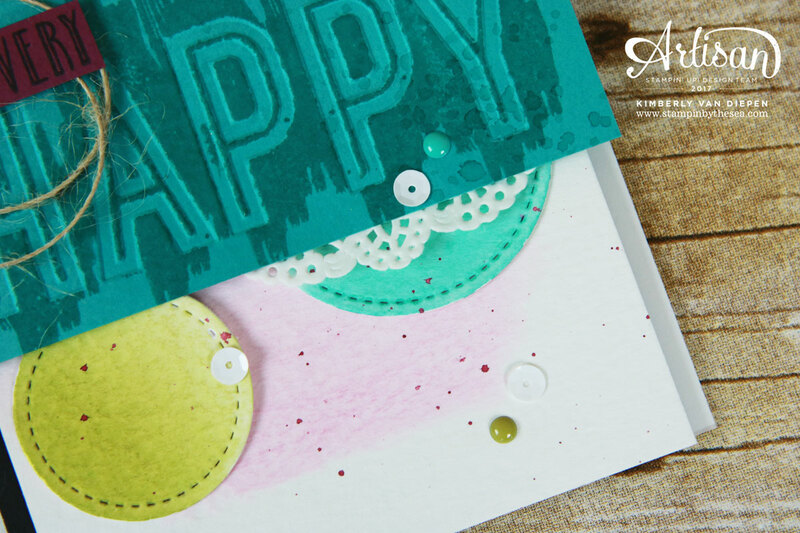 Today I’m sharing a few cards using the Happy Celebrations stamp set. 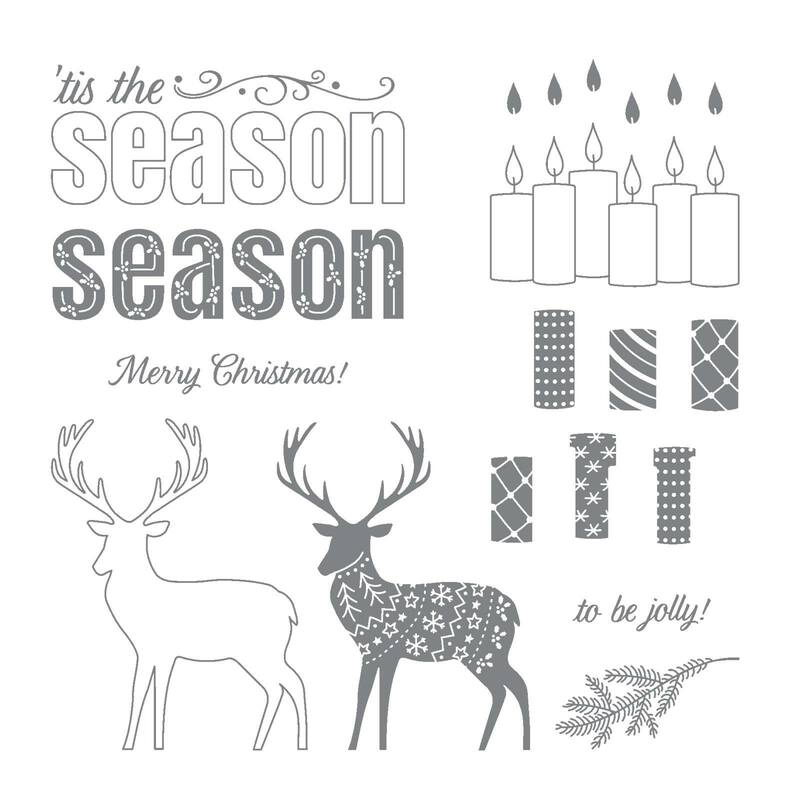 I love the word art in this stamp set. 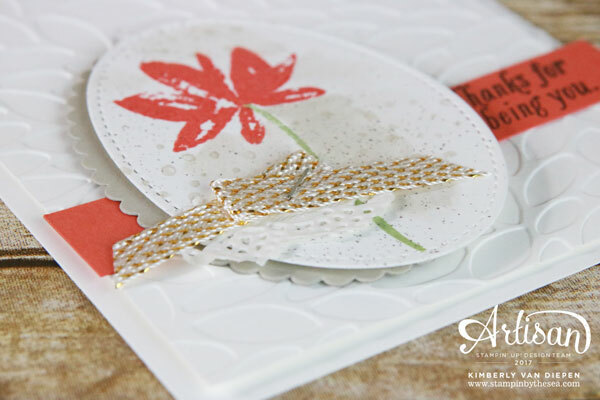 Plus, I am in love with the coordinating Textured Impressions Embossing Folders, Celebrations Duo. If you heard a loud squeal, it was me! I embossed my first piece and let out a big SQUEAL! Oh my word, they are FANTASTIC! The deep impression that the Celebrations Duo creates is great. 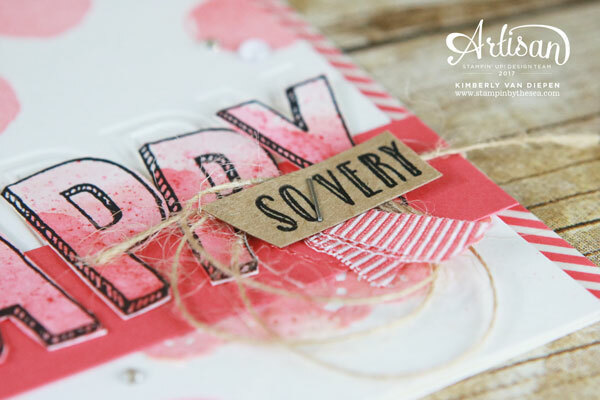 Even better is when you add a little watercolor to the embossed area. HOLY MOLY! Here’s the thing, when I applied the watercolored ink over the embossed area I put it on very wet. I love how the ink pooled and created a shadow around the letters on its own. I cut the 5/8″ Mini Striped Ribbon in half to create a thinner piece. You will notice that the ribbon started to unravel, but this created such a fun look. 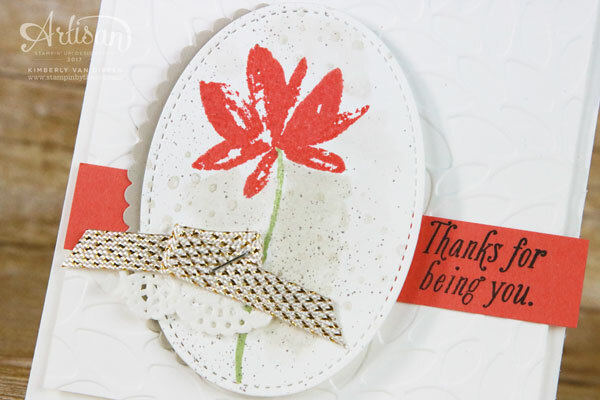 The Celebrations Duo Embossing Folder looks fantastic on Watercolor paper as I used on this card. 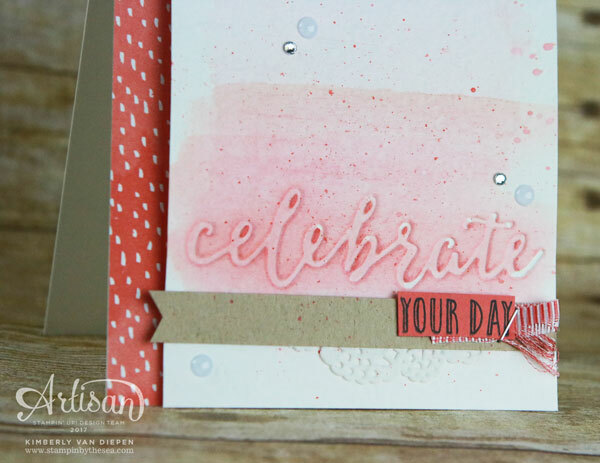 I created an Ombre on the watercolor paper using Blushing Bride, Calypso Coral, and Watermelon Wonder inks. I realize I’ve been pretty absent from my usual blogging. I have so much to tell you and promise to let you in on the happiness soon. My next card made me giggle with joy. It describes how I’m feeling lately. Although I’ve been pretty overwhelmed with “things” happening, the happy meter has been high. Being happy is a great thing, and I think I will frame this card as a reminder of the days my happy meter is low. 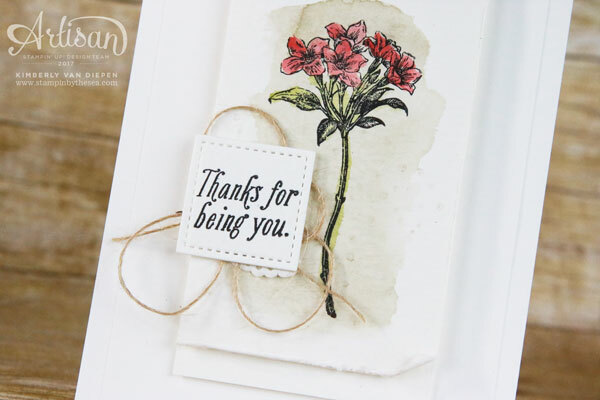 I stamped the word happy onto Watercolor paper using Archival Basic Black ink. Then I watercolored over the entire image using Blushing Bride, Calypso Coral, and Watermelon Wonder inks. Then I fussy cut the letters. 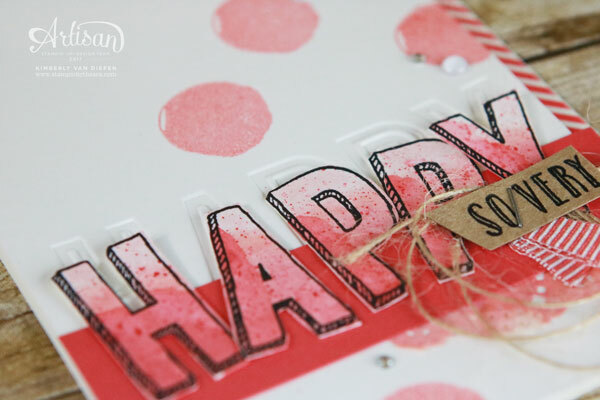 I used the “Happy” from the Celebrations Duo Embossing Folders on Whisper White cardstock. I then stacked the words over, so there was a whole lot of happy coming from this card. 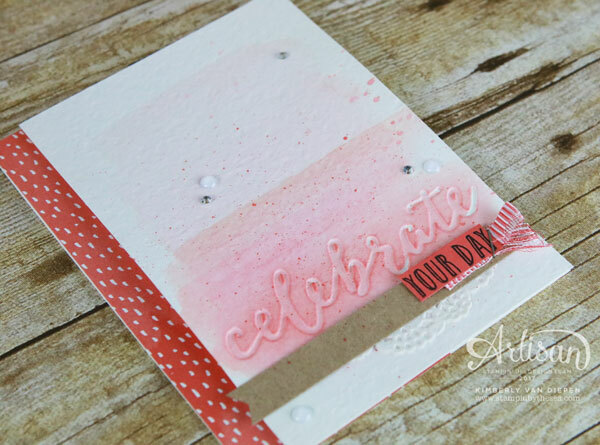 The polka dots were stamped using Calypso Coral and stamped off once before stamping on the Whisper White cardstock. I used the leftover ribbon from the last card to add to this card. Look closely, and you can see I watercolored my Delicate White Doily to Calypso Coral. Boy, can this make you happy quick? Isn’t it wonderful we can make these doilies ANY color we want??? YES! I don’t know about you, but many times I have to remind myself of all the goodness that surrounds me. I can quickly get caught up in a lot of negative Nellie stuff. It’s not healthy. Let’s remind us to put on our happy pants and spread that happiness to others. 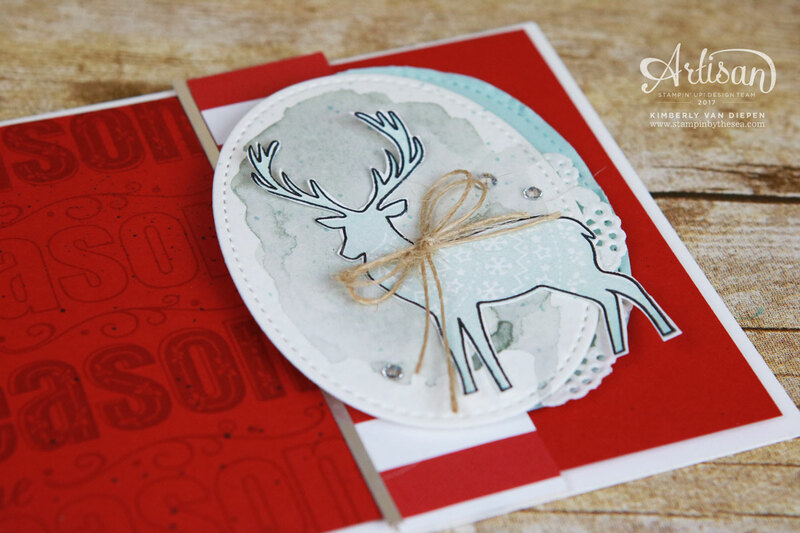 Now be inspired and HAPPY by seeing what the other artisans are sharing today. If anything, find a little time to create, and I’m quite sure you will find happiness. Click the button below to see what the amazing Lousie Sharp has created today. Be prepared to be amazed by her soft, delicate touch she puts on every single project. 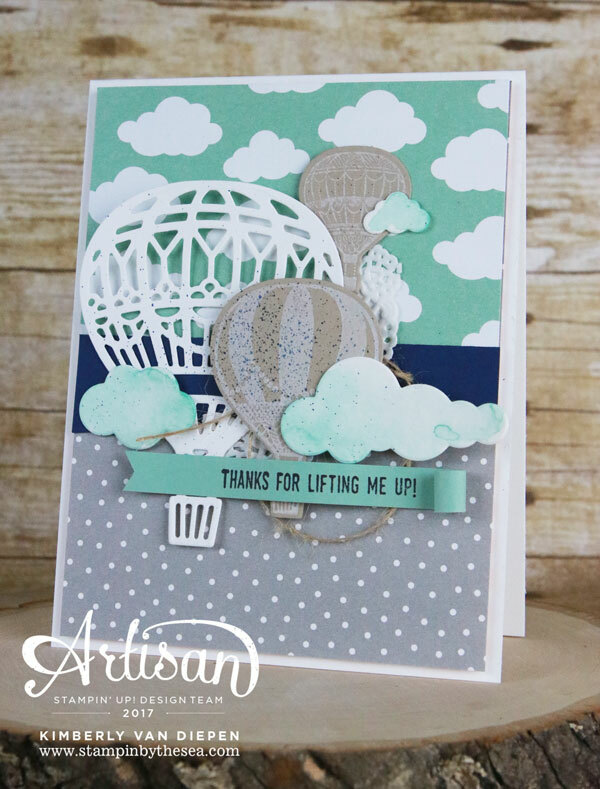 Exciting blog hop today with the Artisan Team using the Lift Me Up Bundle. 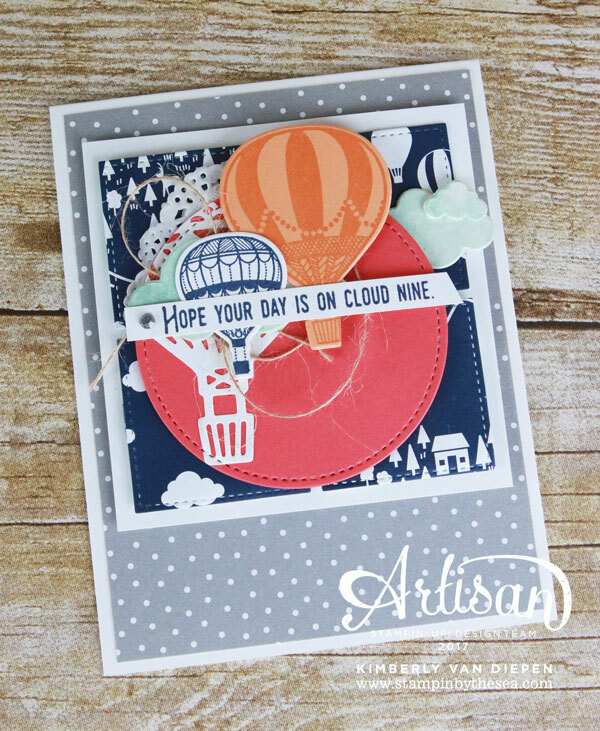 I love hot air balloons and this set not only has beautiful balloon images, but it also has great greetings to go with it. I’m definitely on cloud 9 with this card. 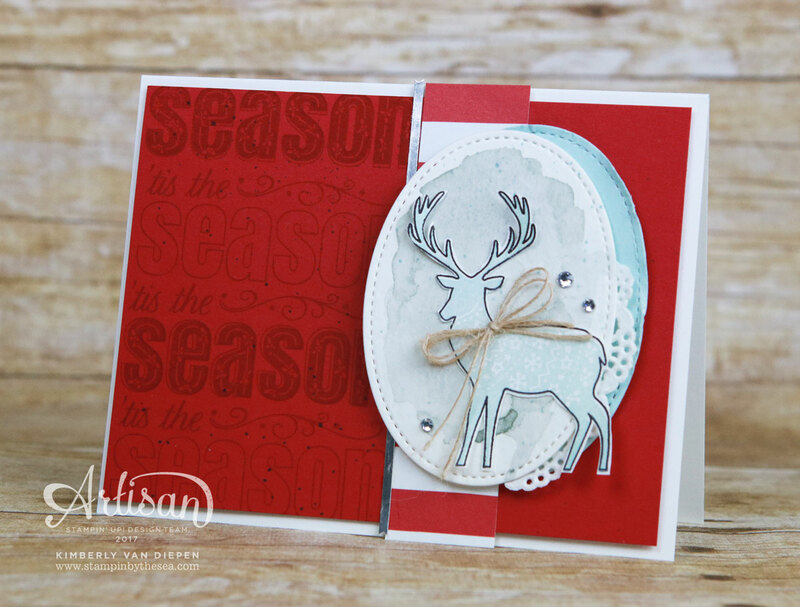 One of the tools I used to inspire me when creating this card was pattern paper. The coordinating paper, Carried Away, is filled with bright, beautiful colors. 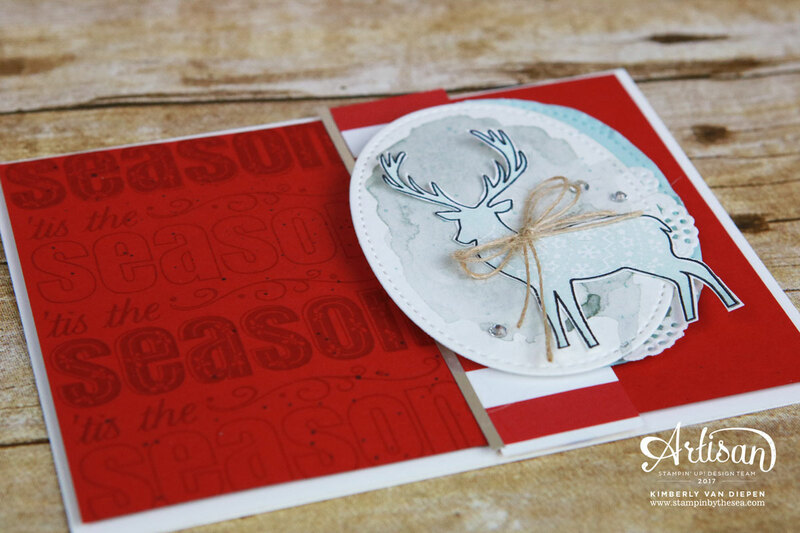 The Carried Away Designer Paper Pack is FREE with a $50 purchase from any of our current Stampin’ Up! catalogs. 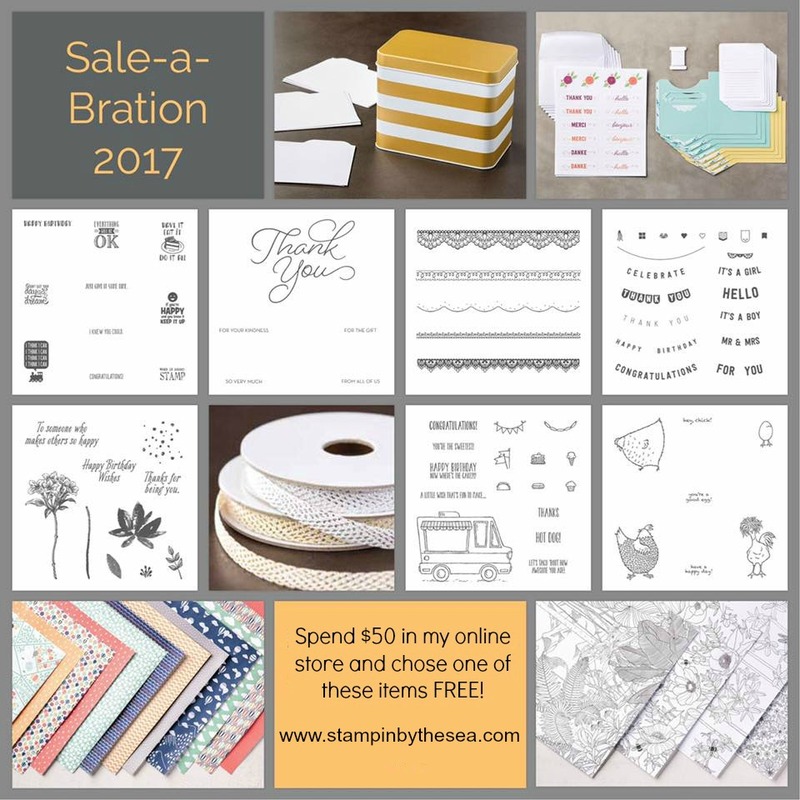 You can find this paper on page 7 of the Sale-a-Bration catalog. I would have never paired these colors together on my own. 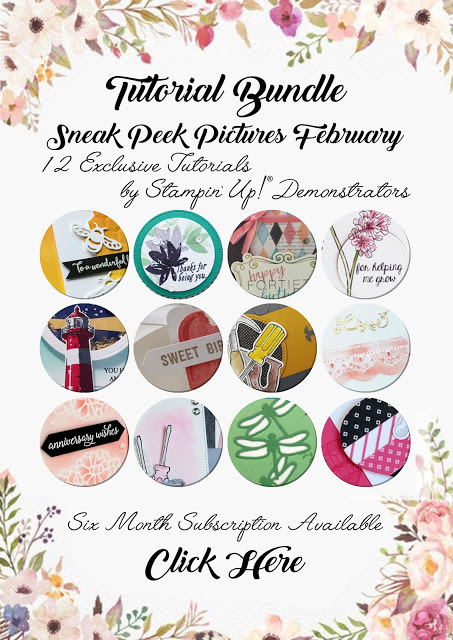 I love how we can be inspired by different pattern papers or by using the catalogs from Stampin’ Up! 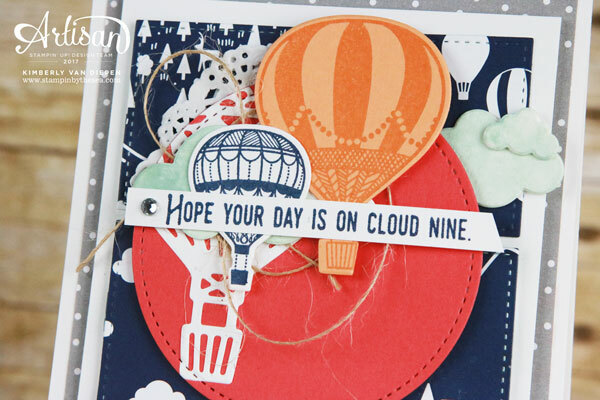 Die cut the clouds using Watercolor Paper and the Up & Away Thinlits Dies. Once I die cut the clouds, I used Mint Macaron ink and my Aqua Painter to watercolor. I created a unique background by die cutting four squares using the Stitched Shapes framelits and Carried Away Designer Series Paper. Once these were die cut, I attached each of squares onto a piece of Whisper White cardstock using dimensionals. 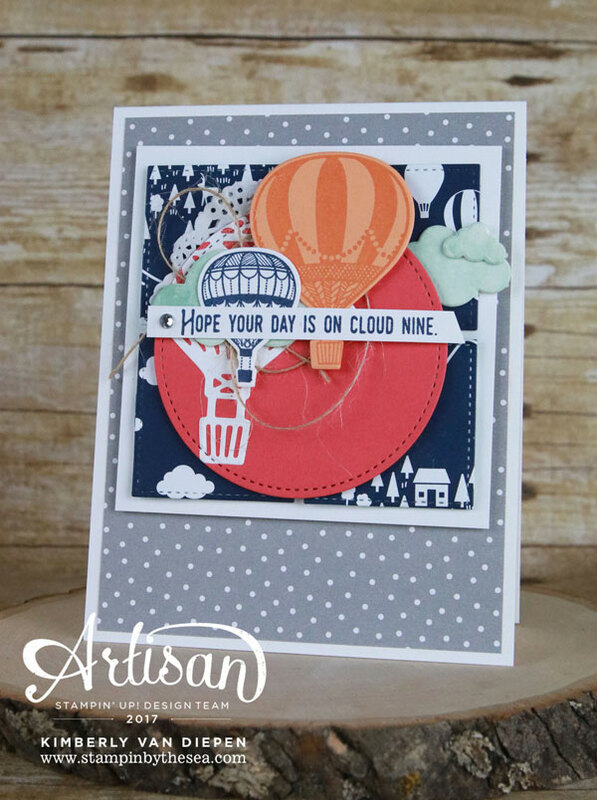 Lastly, I created a fun look by die cutting the intricate balloon image from Whisper White cardstock. After die cutting, I positioned the balloon onto Watermelon Wonder cardstock and die cut using Stitched Shapes largest circle die cut. I decided to use more subtle tones for my second card still using the Carried Away Designer Series Paper. 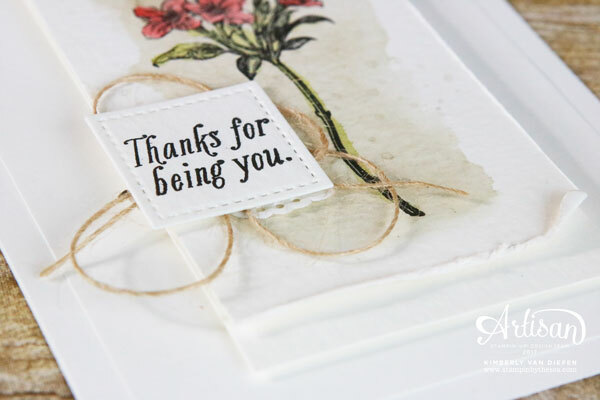 Crumb Cake cardstock is a perfect color to add with any of Stampin’ Up! coordinates with all colors. 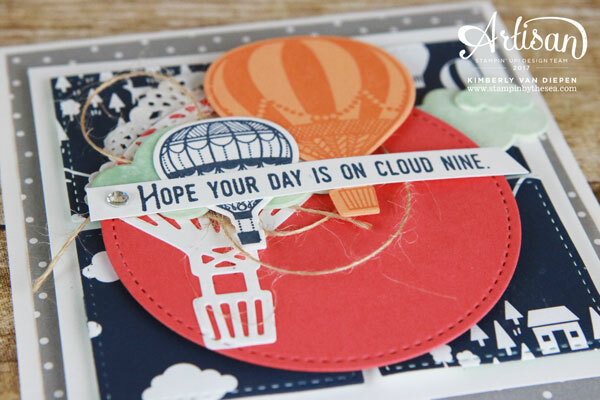 I used White Craft Ink to stamp the balloon image. Make sure the ink is completely dry before die cutting. 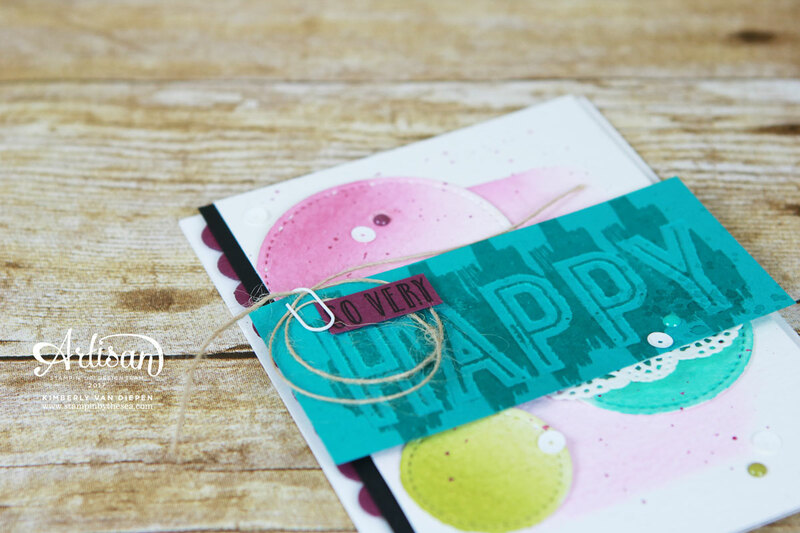 To create a rolled edge on the banner, wrap the cardstock around your Paper Piercing Tool. 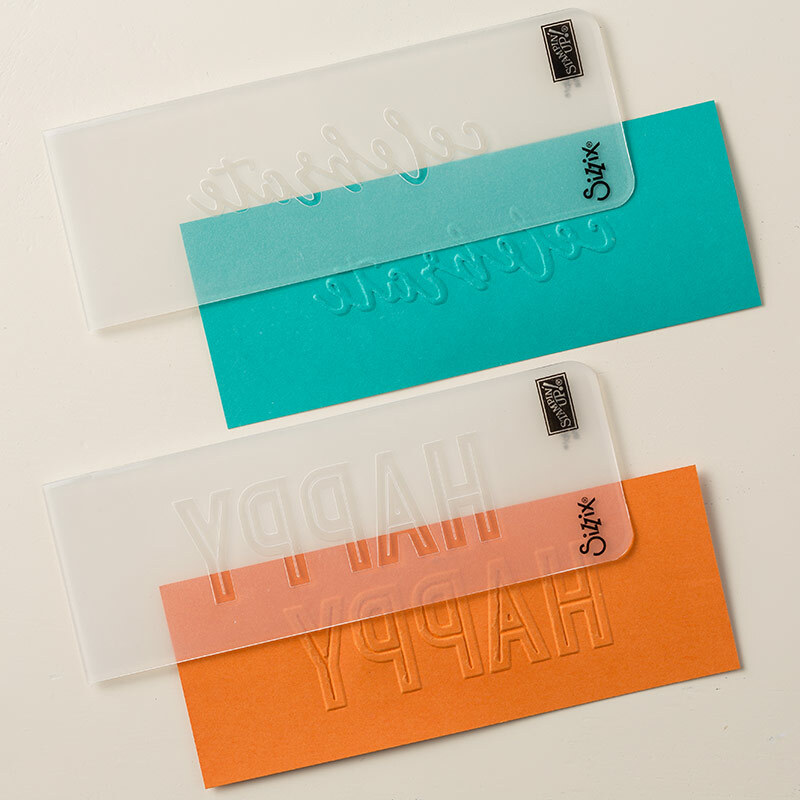 To keep the cardstock in place, add a Mini Glue Dot to the end. 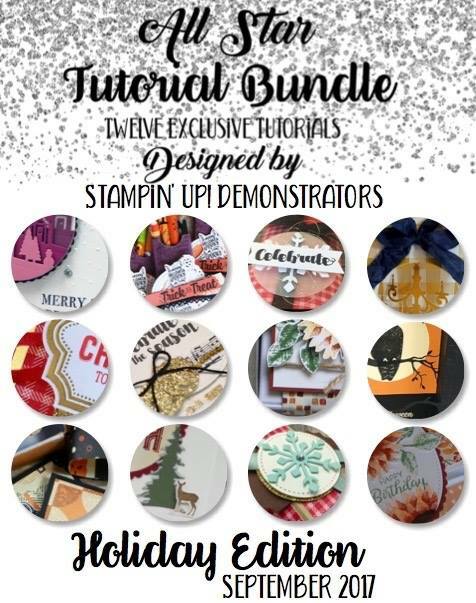 Create layers by using Stampin’ Dimensionals. Find all the products used for today’s projects in the clickable links below. 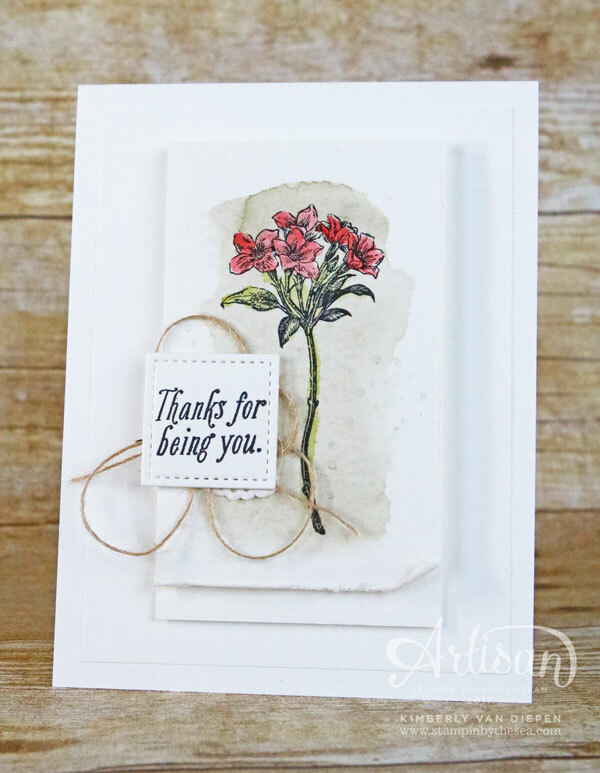 The Lift Me Up bundle is a great set for all occasions and especially if you love to create handmade cards to send uplifting messages to friends and family. 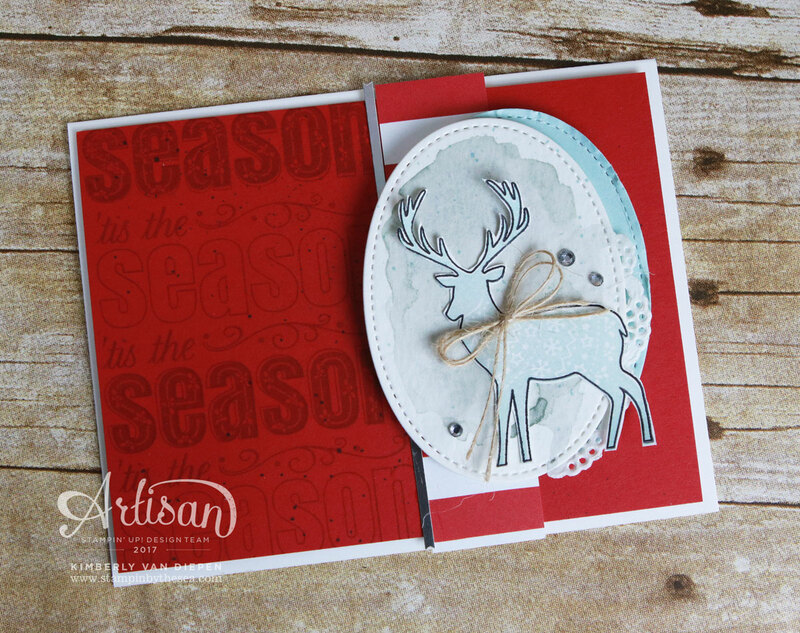 In addition to what I’m shared with you today, there are more inspiring projects to see from the Artisan Team. Up next is my dear friend Louise, who creates the most beautiful projects all the way from Austraila. Her projects always have the most elegant touch to them. 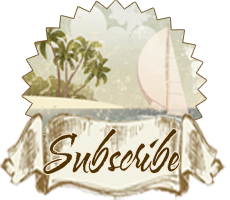 Click the button below and enjoy this hop from artists around the world. 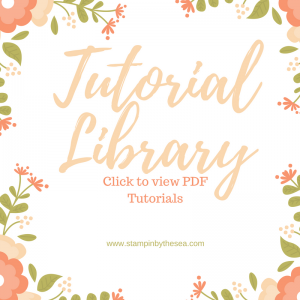 See more ideas using the Lift Me Up Bundle HERE.